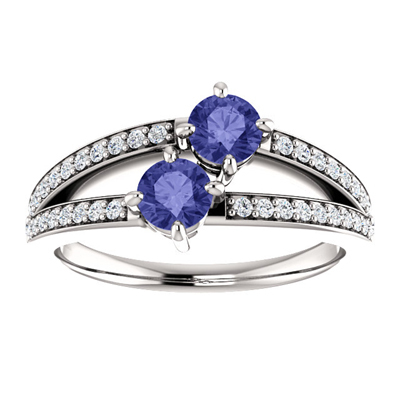 The half carat tanzanite stones on this 14k white gold ring are organized with a slight circular look. The two 4.1mm stones are paired with 46 smaller diamonds on the base to establish an elaborate and amazing look that will make you stand out from the rest of the people out there. This is to show your love to someone who is important to you. We guarantee our Half Carat Tanzanite and Diamond Two Stone Ring in 14K White Gold to be high quality, authentic jewelry, as described above.